Its no secret that the dollar has been steadily depreciating against its peers since the last few years. What is interesting though is that the US Government and Feds though publicly announcing their support for a "strong dollar" don't seem to be perturbed by this. 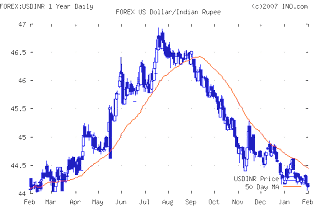 In my opinion the Fed Interest cut announced recently of a half point cut signifies the decision of the Feds to allow the dollar to depreciate. A strong cut in interest rates in their opinion will prevent a hard landing of the housing bubble and at the same time will help reverse the trade deficit issue with China and other asian companies. A weaker dollar will weaken IT companies with an offshore model as it will become expensive for these companies to provide cheap services to US companies. Hence it will help prevent off shoring of jobs. It will also increase manufacturing in the US and will make US exports competitive to the rest of the world. Why is the RBI not intervening in the forex market in a big way? So what should Indians who want to R2I in the foreseeable future do ? Have half your assets in the Indian rupee. Transfer money to India regularly and consistently such that half of your assets are denominated in US dollars and half of the assets in Indian rupees. Invest in international mutual funds in the US that do not hedge the currency risk. Most of the US International mutual funds hedge the currency risk . I believe fidelity funds do not hedge currency risk and some of their international funds have dual advantages of stock appreciation and weakening of dollar. The FDIVX fund is a good example. Buy Gold as a hedge . Gold bullion has an inverse relationship with the dollar. Gold in the form or bars or coins can be sold at all major exchanges around the world. GLD is an ETF traded on the US exchanges and can be bought at any commercial stock broker. Invest in Indian mutual funds as currently there are no long term capital gains for NRIs and resident Indians.